A leading North East roofing specialist is launching its own academy to help invest in the region’s youngsters. Ian Wright has been working for Findley Roofing for 18 months and having excelled in his training, will soon be leading a team of roofers. There is a skills gap emerging and we need to help close it by investing in young people. Washington-based Findley Roofing, will take on four to six apprentices at the Findley Academy over the coming months, where they will be trained to acquire the skills needed to become the best in the business. Each student will be put through an apprenticeship, while at the same time benefitting from hands-on training from the Company, which has over 30 years’ experience in the industry. The scheme, which will run from centres in Washington and South Tyneside, will include one to one training, regular appraisals and the opportunity for apprentices who are excelling to earn more, through an accelerated programme. A short supply of skilled tradesmen is the catalyst behind the idea and the Company hopes resolving this issue, will help them become the roofing powerhouse in the North East. General Manager Chris Dodds said: “There is a skills gap emerging and we need to help close it by investing in young people. “It’s not easy to find hardworking, loyal people but we believe young people are the future and this is why we are keen to invest our time, money and effort into helping them. Findley Roofing is a family run company covering the whole of the North East, from Alnwick to North Yorkshire. Having experienced huge success over the last 12 months, which has seen the team double in size to 38 and a huge increase in turnover, the company is looking towards the future as it plans to maintain this same level of growth over the next five years. Chris continued: “We want to be ‘first for roofing’, just as it says on our strapline and truly believe the Findley Academy is the way to achieve this. “We’re looking for young people who are keen, hardworking, have character and want to learn, as there will be opportunities for them to become team leaders in the future. Ian Wright, from Hebburn, knows just how important the Findley Academy will be to young people across the region and the difference it could make to them. 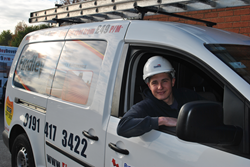 The 25-year-old has been working for Findley Roofing for 18 months and having excelled in his training, will soon be leading a team of roofers. “The knowledge and confidence I have gained since being taken on by Findley and working alongside my mentor, Mick, is huge,” said Ian. “I know I wouldn’t be half the person I am today if they hadn’t given me a chance and I would tell any future apprentices to stick at it, as it’s the only way they will learn.